Germany was still a relatively young country when the Nazis took power in 1933 . The Germans were an educated and cultured people with a solid military tradition. The Nazis implemented an intense and effective propaganda campaign promoting Nazi Doctrine, nationalism and the cult of Adolf Hitler. By August 20, 1934, each soldier was required to swear a loyalty oath to Hitler (instead of the nation or its constitution) which became a troubling reality for many who felt compelled to honor their oath despite the growing realization of what that involved. 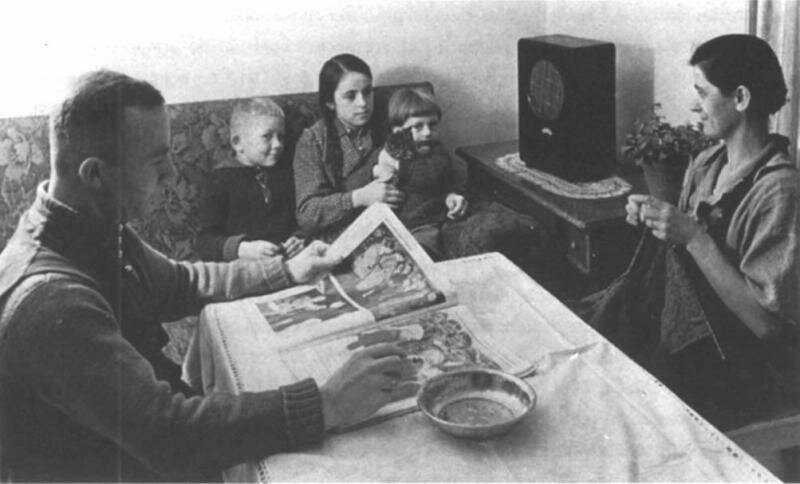 The radio featured here was known as a “Volksflanger VE 301“ (People’s Receiver VE 301) which the Nazis commissioned as early as 1933 recognizing the importance of this medium. Well designed in a Bakelite case, the radios were relatively affordable (at the equivalent of one week’s salary) and became the focal point of many German households. The Nazis kept up a continued drumbeat of propaganda by radio, events and visual art that kept the German people on message. They preyed on the German’s romantic connection to the past with images of chivalry, virtue, sacrifice and nationalism. The walls of this exhibit provide an array of the images that this propaganda campaign kept up which kept the Germans fighting long after it was apparent that it was a losing cause. The Nazis played off of romatic images of the past.such as this Danish recruiting poster for the Waffen SS with a Viking in the background. The message of "Ein Volk, Ein Reich , Ein Fuhrer" ...."One People, One Regime, One Leader" was a constant drumbeat promoting the message of obedience to the cause. The people were constantly reminded that Hitler was the Soldier in Chief, the former infantryman who understood what was required of the common soldier. The Nazis glorified and built off of on the German traditon of military service. There could be no gereater honor than to serve ones country, no greater honor than to sacrifice one's life for their country. The background of the exhibits is a collections of original posters, paintings and images that provides a view of the constant visual message that the Germans were subjected to.